We're Talking About Portal 2 at This Week's Kotaku Game Club! Howdy folks, welcome to week two of the Kotaku Game Club's discussion series looking back at Portal 2. This week we're going focus on the game's mechanics: The building blocks that come together to make the game's puzzles. Remember, since our Portal 2 discussions aren't chronological, there may be spoilers from the entire game today. So only join in if you've finished the game or have no problem hearing about parts of the game you haven't seen yet. Here's a little rundown of the Game Club in case you're a first timer: Our goal is to play games together so that we can share our experiences and discover the game as a community. We meet each week in the Game Club's comments section to discuss our experiences with our game of the month, including its narrative and mechanical themes and our own responses to them. The meeting kicks off at 4pm Eastern every Thursday, and lasts an hour or so after the post is published. The Game Club is here to get everybody talking, so don't be afraid to speak your mind. Here's our question of the week: How does seeing a potentially game-breaking element like Portal 2's white conversion gel change the way you view the game? 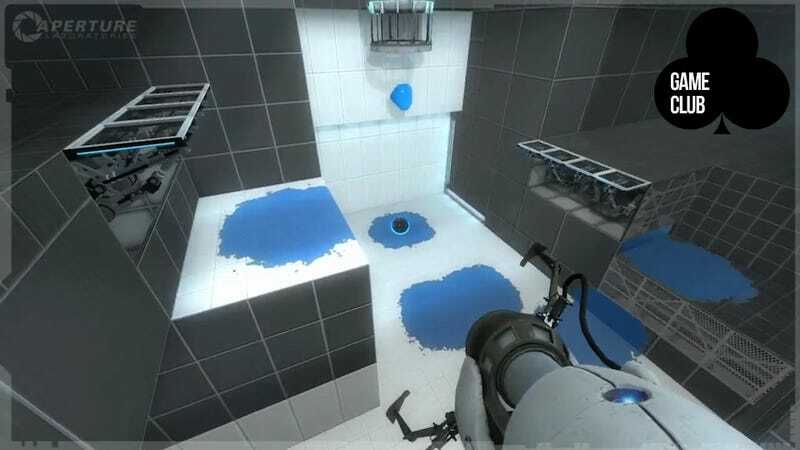 If Portal 2 wasn't a well crafted game, the addition of an element like the white gel, which can potentially allow you add a portal to any scene, could have made every puzzle easy (or at least easier) to solve. At the very least, it takes control out of the hands of designer. Do you think that adding that potential adds to the game? Does make the game's design more transparent? Most importantly, do you even think about it while you're playing? Next week we'll be discussing Portal 2's story. The discussion kicks off on Kotaku next Thursday, January 26th, at 4pm Eastern.